A. L. V. Kumar has been a lifelong practitioner of yoga and meditation. His interest in teaching came about as a result of a car crash that resulted in complete paralysis of the lower body. He used his knowledge of yoga to restore his body to full health. Following this experience he decided to dedicate as much time as possible to teaching yoga to heal both body and mind. Since then he has taught yoga to over 13,000 people in India by conducting free public workshops, in addition to residential meditation courses, teacher training and yoga therapy courses in India, the US, UK and China. 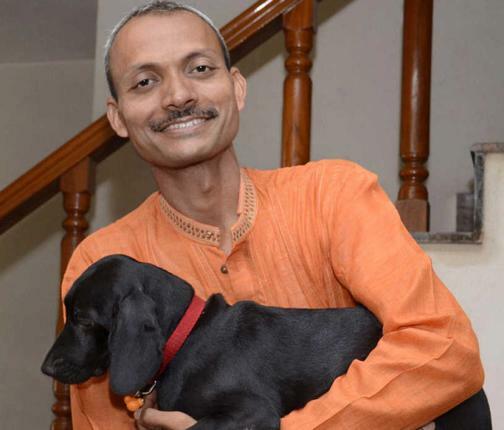 Kumar was recently honored with the Bharat Jyoti Award, The International Achievers Award and the Glory of India Award for his meritorious public service in the field of yoga. Anna Bhushan is a Trustee of the Yoga Healing Foundation, under which Traditional Yoga programs are run. She is a trained yoga and meditation teacher, as well as a painter and lecturer.. She has been studying with A. L. V. Kumar for many years and writes the articles from her conversations and recordings with A. L. V. Kumar. Read more about A.L.V. 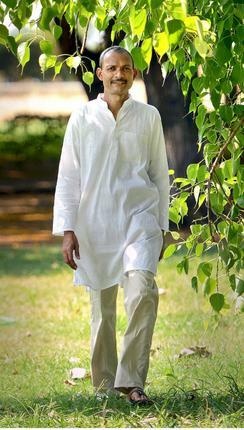 Kumar on the website of Traditional Yoga, Hyderabad, India. Why did you decide to come to the West? The question perhaps should be where is the practice of yoga that has been taught for thousands of years? As this is where the problem lies today. There is much confusion regarding the understanding of the many branches of yoga, hatha, bhakti, jnana and raja yoga and how they are progressive, sequential. People even mistakenly think that Patanjali taught hatha yoga. I wish to clarify these misunderstandings to enable people to make swift progress. Yog is the Sanskrit word which means getting on well with everything, or union; to get along with everything in life, with our own health, with the food we eat, with the work and activities we do, with our family and friends; to remove problems and be free of unhappiness. All this is possible when we get on well with ourselves. Knowing thyself is tattwamasi. The science of getting on well with ourselves is called yog. Exactly the opposite, viyog means separation. Separation brings unhappiness. What do we mean by ‘ourselves?’ This includes our mind and body. In Sanskrit this is described as consisting of five layers, sheaths or koshas. The different sheaths or levels require different inputs. For example food is the input for the annamaya kosha or physical, gross body. Breath is the input for the pranmaya kosha or subtle, life force, astral body. Thoughts are the input for the manomaya kosha, the conscious mind including the five senses, altogether known as the six sense doors. Our perceptions, emotions and instincts are the inputs for the vignana maya kosha or the subconscious and unconscious mind. Happiness is the input that creates bliss. All our problems are brought about by the wrong inputs to these koshas, for example not enough, an excess of or unpure food will lead to an unbalance or sickness. The formula for happiness requires cleaning or removing of all the impurities from the koshas. Yoga is a very precise and practical method to do this job of purifying the body and mind. That is why the study and practice of yoga in its entirety is so useful. It addresses life on every level. You call it Traditional Yoga. Which tradition do you come from, Iyengar or Ashtanga? Since I was a child of 12 years, I have looked into the practices taught in many schools of yoga. But I have only been interested in finding the ultimate reality through my own experience. I would sincerely follow any teacher or technique I came across until I knew the practice, had fully grasped it and could evaluate it in the context of my own life and behavior. I was never prepared to remain in one school until I had investigated all available knowledge. I have studied in about 26 schools in the north and 12 in the south including Iyengar, Ashtanga, Sivananda, Kaivalyadama Lonavala, Bihar school of Yoga, all Kriya Yoga traditions of Lahari and non Lahari traditions. As I said before, I am teaching the genesis of yoga not just one school or another. So many teachers are teaching to the best of their knowledge but unfortunately this knowledge may be limited to one teacher or tradition. They may be teaching certain asanas or postures but without the traditional understanding of the whole process, the integration of all the various limbs and how the practice unfolds. And so many of the pranayamas, bandanas and mudras, which are so effective, are slowly becoming extinct or have been lost altogether. These work on a cellular level, to rejuvenate and balance the whole system. There is little understanding of the relationship between the yoga that makes the body healthy, flexible and strong and the yoga that purifies the mind and leads to ultimate happiness. Actually hatha yoga is a preparation for inner yoga, sometimes called raja yoga, king of the yogas, which strengthens the mind and removes the impurities that lead to suffering. Is it true that you were once told you would never walk again? Yes, in 1992, I had a road accident in Pune and my pelvis was crushed by a truck. Except for those days following the accident I had never suffered physically or mentally because my body was like a tensile rod. It just bounced back whenever it got shocked and recovered very quickly. I use awareness as a tool to recover, not suppressing anything. The accident resulted in multiple fractures to my lower spine, hip and pelvic bone, and I lost complete control of my lower body because the back wheel of the truck had crushed my hip region. I was bedridden with a ruptured urethra, the pelvic bone having pierced the tube. The edge of the pelvic bone was so sharp it made sitting impossible. I had to go for dilation of the urethra every two months. The doctors told me I would probably be unable to walk again. After a year my condition had not improved. My physical health was fine apart from the problems with walking, urinary discharge and reproduction function. I was due to be married so I tried to persuade my wife- to- be and her family, to cancel the marriage for her sake. What kind of life would it be for her with a husband so damaged? The doctors also advised them that that would be the sensible course of action. But she insisted the marriage go ahead as planned, so I was airlifted to the ceremony. After two years with no change I decided to ignore the doctors’ advice and began to practice yoga. At first it was very painful. I used my knowledge of the asanas, mudras and bandanas, and after a year I could not only walk but run and finally resumed my previous 300 asanas. Eventually I was blessed with two daughters. It was that experience of the healing potential of yoga that made me decide to dedicate my time to teaching. Kaya chikitsa is a form of yoga that can be practiced on people unable to practice for themselves; it is for the seriously ill or bedridden. When I was in the Himalayas when I was quite young, I was approached by a man. His family was the last from a long tradition to practice this system. As he had no sons to pass it on to, in order to prevent this knowledge dying out altogether, he asked me to study it along with two of my friends. I only started using it after many years when I had made the decision to try to help people, and since have had good results for a number of problems such as cancer, muscular dystrophy, heart problems, skin diseases such as erythrodermatitis, spinal problems including slipped discs and spondylitis, reproductive problems such as infertility, polycystic ovaries, thyroid and respiratory problems like asthma and sinusitis. It is a very good system. I have trained a few people to do this work but you need to be physically strong and fitas it is very demanding. Apparently you are a nuclear scientist – how do you reconcile the nuclear industry with teaching yoga? Like many things, nuclear power can be used to help or to harm. I am a scientist and I work on the processing of fuel at a government plant. At our plant we have developed many processes that would help in a closed fuel cycle, so there is very little waste compared to the west. This is because the quality of the uranium in India is quite poor so we need to use it as effectively as we can. In India we are developing at a very fast rate and there is a great need for energy. It is important to take a responsible attitude to this problem of conservation of energy and to greatly reduce the burning of fossil fuels. By tradition, teaching yoga should not be used to earn one’s living in India. I am a family man so I work as a scientist to support my family. I have no desire to be a guru. My only aim is to spread understanding of the traditional practice and the integration of yoga, to speed up the progress of all practitioners, and to help free as many as possible from physical and mental suffering. For that we need as many people teaching as possible, not just me. Perhaps in India we become a little cynical of the five star gurus who come to the west and enjoy the fame and fortune available here, and I’m afraid there are some gullible people who follow them. Blind faith is a dangerous thing. They teach maybe one or two techniques, and people are happy. People think this is the ultimate without looking further. That is why it is important to intelligently test what they say, to scrutinize them carefully and see if you do get what they claim to be offering. Is there any change in your behavior? Can you react without any anger or hatred to others? Can you be happy with whatever happens? The great scientists of the mind such as Buddha, Jesus, Mohammed, Patanjali, Guru Nanak, all spoke about removing defilements and developing love, compassion, forgiveness and equanimity. This should be the test of any teacher. How do you reconcile your responsibilities as a family man with your commitment to yoga healing? In India the family is still very important. We mostly live with our families and grandparents, aunts, uncles living close by. This gives everyone support. My wife works and my children are still at school. In my spare time I teach yoga and see people individually if they have serious problems. It is a matter of using one’s time efficiently and trying to help as many people as possible. I met you guys in April 2011 at the S-VAYSA , Arogayadhama , Bangalore. May I please have e mail and phone contact information for A. L. V. Kumar ? Thank you. Hi Piara, thanks for visiting! You can get in touch with Kumar via the Traditional Yoga website. Please see the link in the post. what about a “neurological” turn in union if western and indian science, yoga and philosophy??? Kumar sirs teachings are like the manifestations of a saint supported with rational and logic.The genuineness and passion with which he teaches is contagious…The time I was under his tutelage in Hyderabad was perhaps the best introspective moments of my life.